Running back was considered a position the Seahawks would target at some point with the retirement of Marshawn Lynch, leaving Seattle with just three running backs on their current roster. RENTON — With their third pick of the 2016 NFL draft, the Seahawks selected running back C.J.Prosise of Notre Dame. Also, projected starter Thomas Rawls is rehabbing from a broken left ankle suffered at the end of last season. Though he is expected to be fine for the season the team knew it had to add depth. Seattle also has Christine Michael and recent free-agent signee Cameron Marshall as running backs on its roster. Prosise is listed as 6 feet 1/2 inches and 220 pounds and has been likened to former Seahawk Ricky Watters, who also played at Notre Dame. Both played some slot receiver in college. 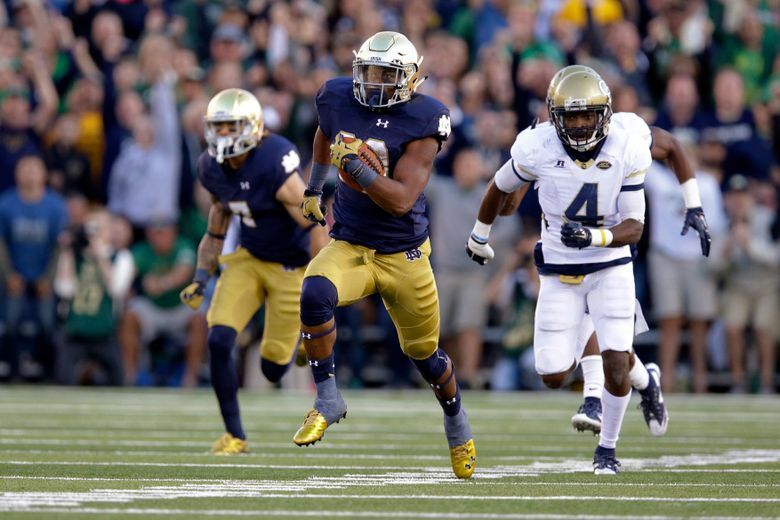 Prosise rushed for 1,032 last season when he was a full-time running back and had 26 receptions for 308 yards. Seattle made the pickat No. 90 overall, its first of three third-round picks.